Cool temperatures and glorious skies mark Malta in November. Clouds tinged with gold, red, crimson, blue against creamy-yellow limestone, echo Titian, Veronese, and maybe even Turner. A fabulous blend of colours – Nature always remains the greatest artist. 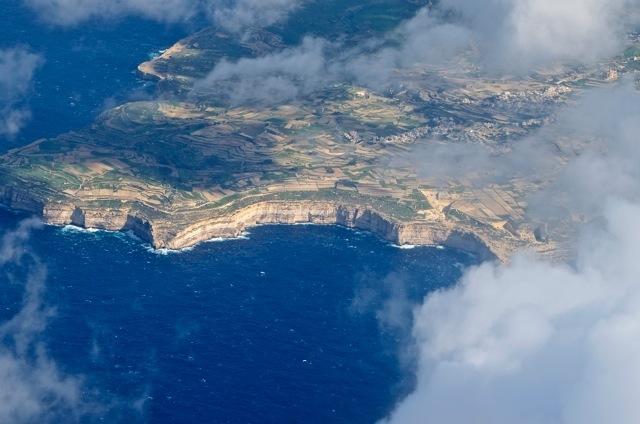 The Maltese archipelago is a remnant of the geological land bridge, over 40 million years old, that once linked the continents. It is the shallowest stretch of the Mediterranean, dividing the sea into its eastern and western halves and, underwater, connecting Sicily and Tunisia. Local people identify Gozo as Calypso’s isle where Odysseus was kept as a love slave over 7 years for the pleasures of the goddess-nymph. Eventually, helped by Athena, he was allowed to go, but not before being offered immortality as a last temptation. Away from myth, the temple blocks of Ggantija are composed of stones, several tons in weight, that are considered by Unesco and confirmed by carbon-dating, to be the oldest buildings in the world. They were left by a neolithic people who made their home there, long before the pyramids of Egypt were constructed, but who disappeared mysteriously around 2000BC. It is the Knights of St John, however, who left the biggest impact on the main island . The warrior-monks transformed it into a fortress and, after victory over the Turks in the Great Siege of 1545, the island became known as the Shield of Europe. The Knights’ familiar eight-pointed cross was said to symbolize the main elements of the Sermon on the Mount as well as the different national groupings or “langues”. It is in their Cathedral of St John that one of Europe’s greatest art treasures can be experienced. Just entering the main church there is a feeling of celebration and exuberance, apparent from floor to ceiling. High above, the ceiling paintings by Mattia Preti recount the life story of St John the Baptist. Behind the altar, marble figures portray the Baptism of Christ but it is the floor that soon becomes the focus of attention. 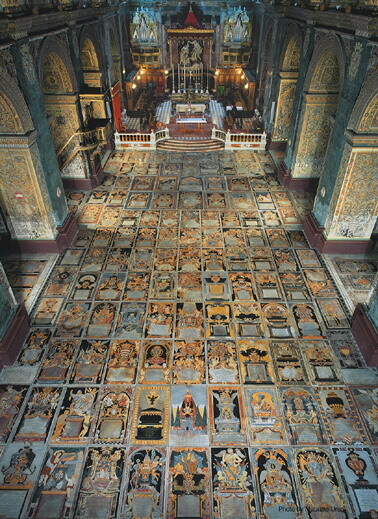 Like a tapestry of color in marble, filling the whole nave, are some 400 brilliant decorative tombstones of Grand Masters and major figures of the order, each with a story and image. This alone would make a visit to the Cathedral unforgettable. It is, however, just a preamble to the Oratory which contains a powerful and graphic portrayal of the “Beheading of John the Baptist” by Michelangelo Merisi da Caravaggio. The Oratory was a place for meditation and prayer by young knights newly inducted into the Order. It was also a place of judgement. Caravaggio was commissioned to fill a whole wall, more than 3×5 meters, with an altarpiece. Traditional portrayals of St John the Baptist range from the optimistic depiction of St John as a child in Leonardo da Vinci’s “Virgin of the Rocks”(in Paris and London), to scenes from his life, such as those painted on the walls of the cathedral in Prato by Fillipo Lippi, focusing on the dance of Salome as a principal element. Alternatively he appears as a teaching figure on the side of God holding a book, such as in the exquisitely detailed Ghent altarpiece “The Lamb of God” by Jan Van Eyck. Caravaggio, however, chose a radically different approach to his subject.Variously called “The Painting of the 17th century” (!) or “the first work of a modern art”, the artist presents a scene involving the spectator in the moment after the beheading, the used sword still lying on the ground. Caravaggio usually painted from live models, so his contemporaries saw his art as “not painting but truth”. Here only the expression on the dead saint’s face is peaceful. A bright ray of light highlights the central scene, in the background prisoners look out from a building said to resemble the Grand Master’s Palace in Valletta. The stark theme breaks away from illustrating a biblical past to a vision of an artist familiar with murder,violence and brutality. It is a work that speaks to a post-Auschwitz age where “only following orders” became the standard, emotionless explanation for unspeakable horror. It has consequently been described as one of the most important works in western painting even though darkness seems to prevail. The artist, having been made a knight himself in the same Oratory, was shortly a fugitive once more, escaping from an impregnable prison. In absentia, he was ceremonially disrobed by the knights in front of his masterwork, a cloak being pulled from a stool in the original place of induction. On the wall facing the “execution” is Caravaggio’s “St Jerome Writing”. Faintly behind the figure, a cardinal’s hat can be seen hanging from the wall of the hermit’s cell. He almost seems to be contemplating the events opposite. St.Jerome, an early Church father is shown with a skull symbolizing the transience of life while a candlestick suggests spiritual illumination. 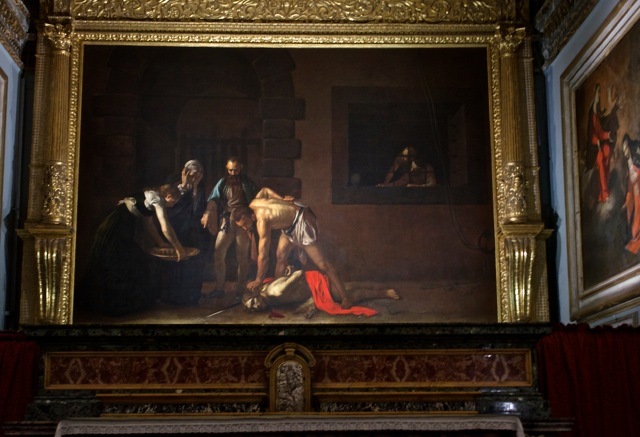 Like the larger picture it is painted mostly in brown but also underlined by a defining strip of red, in this case the saint’s robe Originally in a different location, it was moved to the Oratory after being stolen in 1984, held for ransom, then recovered in 1986. Another attempted theft, this time on “St John” badly damaged the picture. It is unlikely that either work will leave Malta again. Escaping from Malta, a paranoid Caravaggio went on to portray himself as a severed head of Goliath held by David and as a head on a platter in “Salome With Head of John the Baptist”.Shortly afterwards he was dead, in mysterious circumstances, at the age of 39. Today he remains a figure of interest and speculation. Did this genius murderer fugitive exhibit violent behaviour as a result of lead poisoning from the paint used at the time? Was he unstable due to the trauma of losing most of his family to plague when aged six? Certainly dark stories penetrated by beams of light became his trademark. Many consider that Rembrandt could not have existed without him, and his major works, particularly “St John” in Malta, are seen as the most spiritually intense paintings in the history of art. This, his largest work, is the only one he ever signed using the red, painted blood of the beheaded saint, an ultimate acknowledgement. Seeing the Caravaggio’s in Malta can be a life-changing visit. What better place for a meaningful winter break? Disclosure: LG visited Malta courtesy of Hilton Hotels and EasyJet, organized by the Malta Tourist Office.